100% solar-electric refrigerated trailers are the next frontier in food transportation – and eNow is leading the way. “Refrigerated and Frozen Food” magazine asked eNow solar expert Bob Doane to report on trends in solar technology that will impact the food industry. Bob explains why eNow’s 100% solar-electric “reefer” systems — featuring an array of 1/8″ thin, flexible, solar panels on the roofs of 53-foot refrigerated trailers – will soon replace traditional diesel-powered systems. 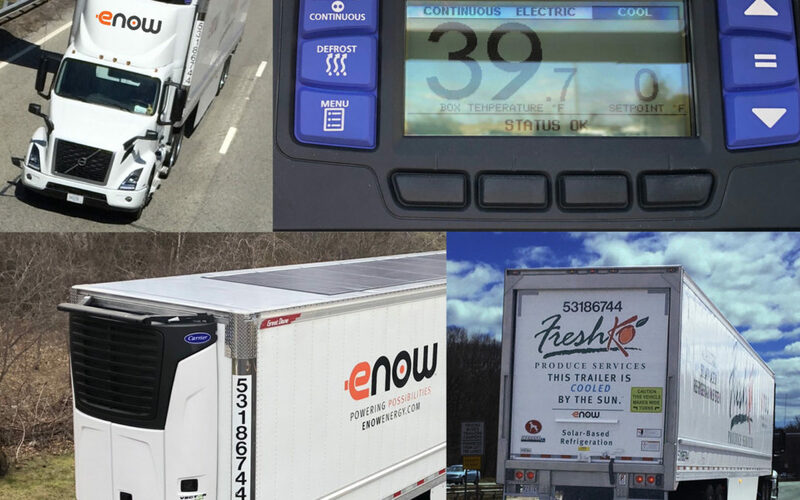 eNow’s patented technology promises abundant economic and environmental benefits to food manufacturers, retailers, wholesalers, and distributors with large fleets. Click on this link to read the full report in Refrigerated and Frozen Food – March 2019. Heavy Duty Trucking magazine has announced its 2019 Top 20 Products, highlighting the most innovative, significant, and useful new product announcements from last year. Making the list are eNow’s solar-electric, diesel-free reefer systems for trailers which promise to revolutionize refrigerated transportation. By eliminating diesel and using eNow’s proprietary solar-electric system, refrigerated fleet owners such as food retailers, distributors and manufacturers will see rapid ROI, saving millions in O&M costs per year – and dramatically reduced emissions. How does it work? The eNow solar system, which covers the trailer’s roof, powers the trailer by day – typically for 10-hour delivery routes. At night, back at the distribution center, the trailer plugs into shore power to recharge the system. A bonus is that electric reefer systems require less maintenance than traditional diesel models and have a longer asset life. While the eNow system is currently a single medium-temp design, multi-temp eNow systems will be available by 2020. They are also compatible with new reefer trailers by all manufacturers. About the HDT Top 20 List for 2019: The winners are published in the February issue. Awards will be presented during individual ceremonies at the American Trucking Associations’ Technology & Maintenance Council annual meeting at the Georgia World Congress Center in Atlanta March 18-21, 2019. 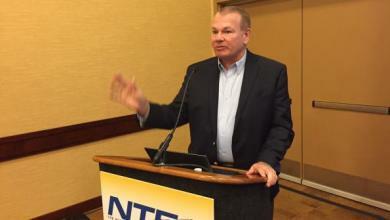 Each year, HDT editors spend a lot of time going to press conferences and combing through news releases on the latest new products for trucking. At the end of the year, they embark on a process to identify the very best of the past year’s introductions for the Top 20 Products. Editors sifted through all of the new product announcements that appeared in the magazine or on the Truckinginfo.com website over the course of 2018 to winnow down the list. Products are chosen based on the level of innovation, ability to address significant industry issues, and potential benefit to the bottom line. HDT editors then consulted with the HDT Editorial Advisory Board, made up of executives and managers representing fleets of a variety of sizes and types, to arrive at the final 20. Entire vehicles are not included, and products must be commercially available or scheduled to become commercially available this year. Fontaine Modification Fleet Services now offers installation of solar panel systems from eNow Solar Energy Solutions, capable of powering certain systems on a heavy-duty truck. Fontaine’s Statesville, North Carolina, location recently upfitted 26 sleeper tractors with the panels, which capture energy from the sun and are capable of producing 300 watts of electricity per day. The power can be used to charge the truck’s auxiliary batteries, which are then used to power HVAC systems, liftgates, refrigeration, telematics systems, and other auxiliary equipment. The solar panels from eNow are flexible, lightweight, and thin, measuring only 1/8-inch thick. The panels are sealed to protect against ice, debris, corrosion, and extreme temperatures. Fontaine offers installation of eNow solar panels at all of its modification centers. 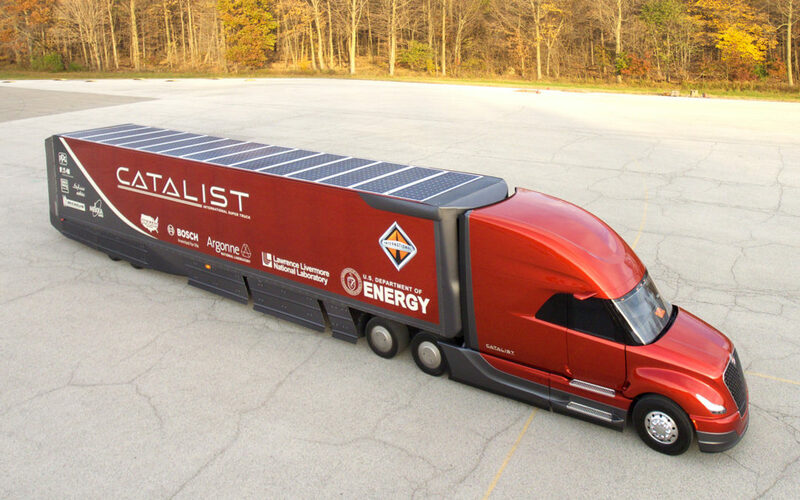 While solar energy cannot power a Class 8 truck, it can supplement the charging capacity needed for some tractor and ­trailer accessories. The additional charging capacity has prolonged battery life while reducing operating and maintenance costs. Applications of solar power on tractors and trailers turn ­solar energy into electrical energy to charge batteries used for liftgates, as well as cab and ­sleeper heating and air conditioning. Fleets report that solar systems have virtually no maintenance requirements. The conclusion of the North American Council for Freight Efficiency (NACFE) is not a surprise since all three solar-equipped trucks in their 2017 Run on Less demonstration utilized eNow solar power systems. The demonstration program provided hands-on driver feedback to inform the newly published Solar Confidence Report. Click here to read the full report. No better place to unveil a disruptive new green technology than at the ACT Expo 2018 (Advanced Clean Transportation) in Long Beach, California. eNow has clearly done so with its All-Electric Solar-Based Refrigeration System deployed on a 53-foot trailer. The eNow “reefer” trailer integrates its proprietary, solar technology, battery storage, and its patented electronic control system. eNow has focused on the transportation industry since its 2011 founding. It also builds solar-based power systems for in-cab HVAC and hotel loads, liftgate battery systems, and telematics that require an energy source to ensure auxiliary batteries are always charged. eNow proved the effectiveness of its solar energy-producing systems for transportation by powering the first zero-emissions commercial-use Transport Refrigeration Unit (TRU) on a truck making deliveries in an urban environment. 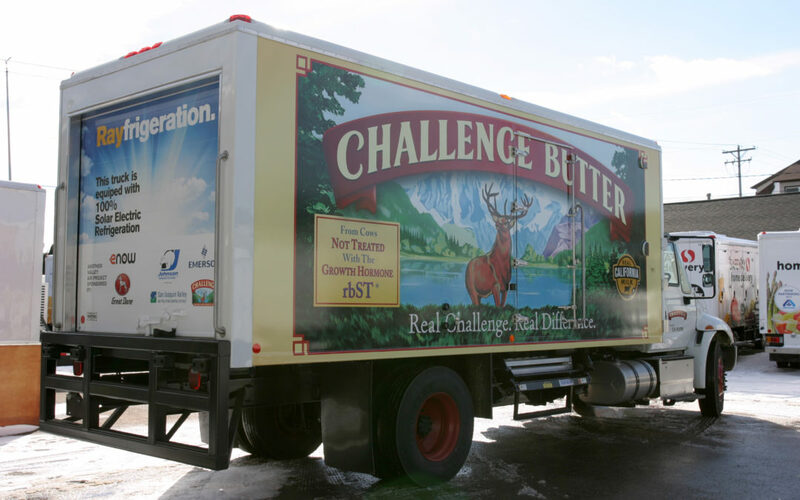 The new zero-emissions TRU branded “Rayfrigeration,” has been undergoing real-world testing since April 2017 in California’s San Joaquin Valley. In five months of testing, emission reductions of 98% nitrous oxide, 86% carbon dioxide, and 97% particulate matter were achieved. In talking with the drivers and fleets present at Sunday’s event, it was clear to me that all 7 of the trucking teams have 3 things in common. So, there you have it: 7 + 3 = 10 [7 fleets] + [3 best practices] = 10 mpg. Saving fuel is really as easy as 1, 2, 3, and the Run on Less fleets have given us the blueprint. What was the coolest technology you saw at the event? If I have to choose one, I’ll go with Mesilla Valley Transport’s air conditioning system, which is powered by solar panels on the roof of the tractor and trailer! 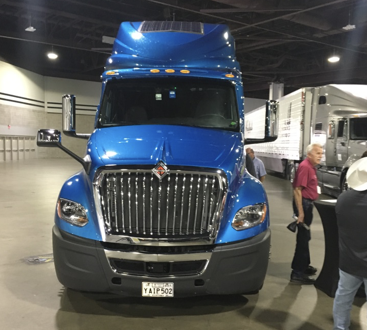 All week at the North American Commercial Vehicle Show in Atlanta, nearly every presenter has mentioned electric trucks and the growing electrification of the trucking industry. So, it was no surprise when solar company eNow noted how it too could help with these growing electric needs. 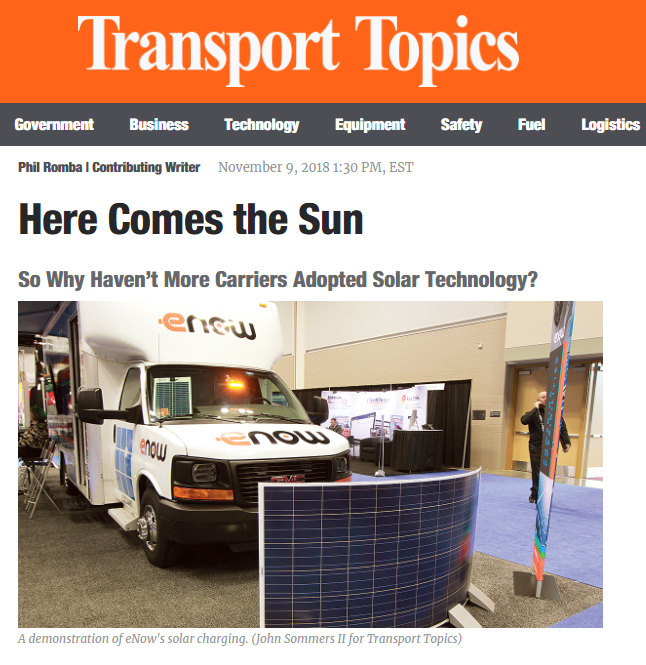 eNow is ready and eager for a world where solar power turns vehicles into mobile charging stations.That was the message delivered by president and founder of eNow, Jeff Flath, at a press conference at this year’s North American Commercial Vehicle (NACV) show. 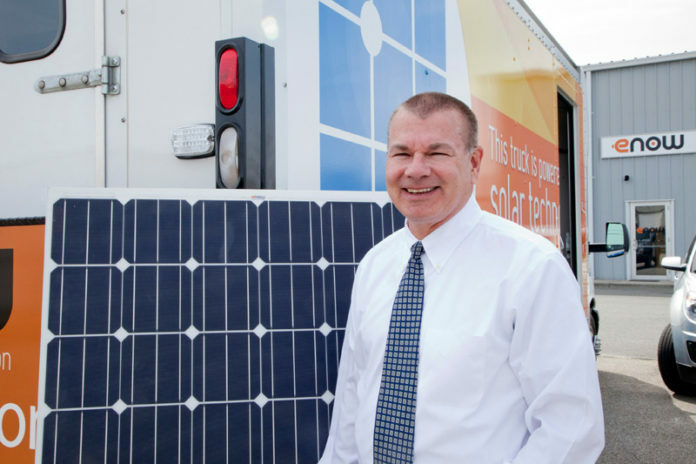 “I founded the company in 2011 to bring solar-based auxiliary power units to the trucking industry,” he said. eNow systems pair medium- and heavy-duty vehicles with solar panels, to turn them into mobile power stations on the go. To date, eNow’s core business includes Class 8 truck and trailers and RVs and school buses. 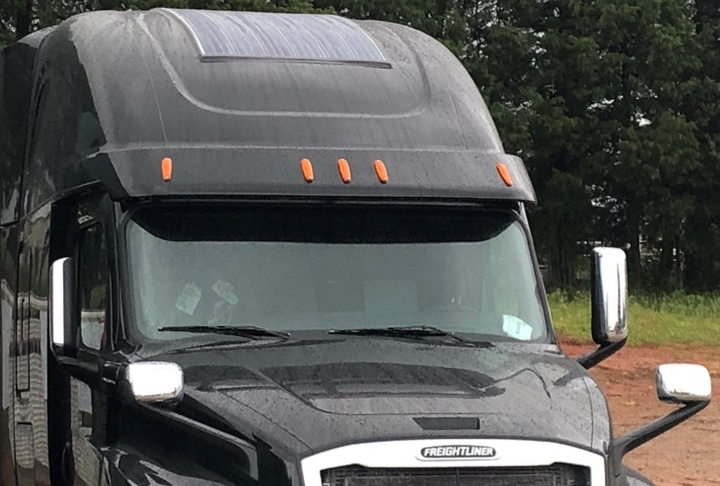 Freightliner Cascadia raised-roof sleeper trucks can now be ordered with the eNow eCharge solar system as a pre-delivery installation. The eNow system can be ordered through Freightliner dealerships and installed at Freightliner’s Custom Truck Service centers located at each of the manufacturing plants. 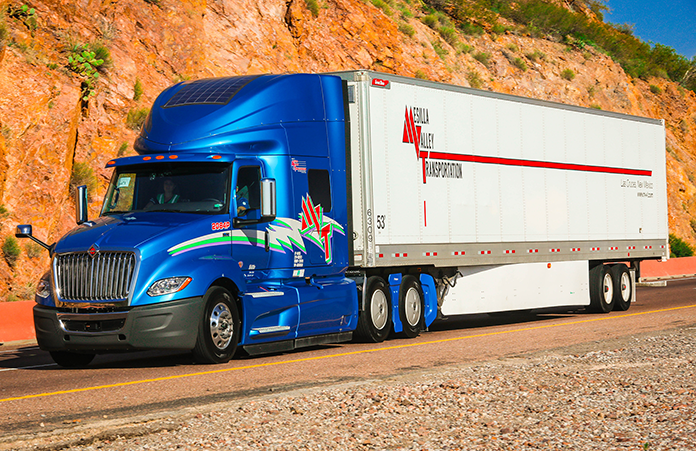 Mesilla Valley Transportation recently purchased close to 1,000 eNow energy systems for their fleet of Navistar trucks. eNow and Mesilla Valley Transportation (MVT) will showcase the eNow solar auxiliary power system during the NACFE “Run on Less” program taking place September 5 to 23. WARWICK – Solar-energy equipment supplier eNow Inc. just locked down a new big investor. Canadian Solar Inc., a leading solar provider in the global market, has purchased a 10 percent stake in eNow, the Warwick-based company announced Thursday. Ask The Thought Leaders: What’s The Future Of Green Tech? Up until last year, it seemed the future of green tech was… inevitability, and a total replacement of less efficient technologies. 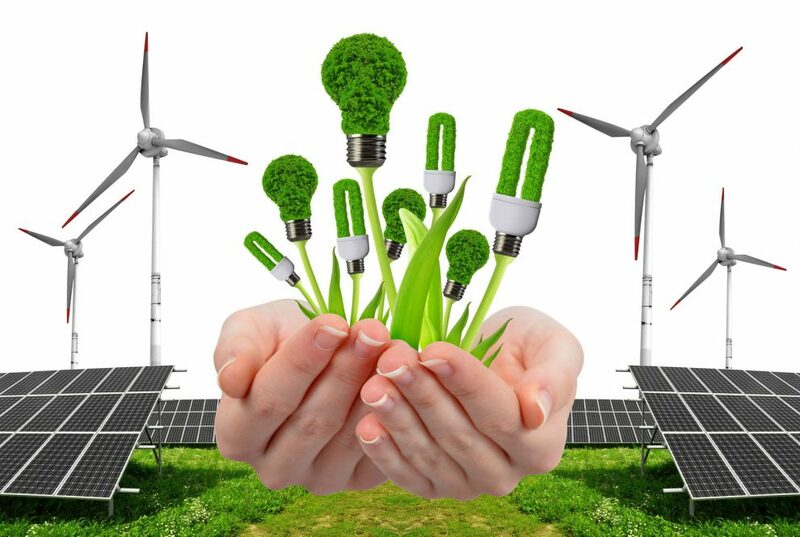 However, with the recent change in the political landscape in the US, it would seem that advancements in green tech will be somewhat stalled, at least for the next few years. However, although 2016 was the first year to see a decline in clean energy investments, Green Tech Media tells us not to panic just yet, things are still moving in a positive direction. -And they’re right. Green tech in the automotive industry gets better every year and we’re seeing a global push to decarbonize industry altogether. Solar panel system provider eNow is offering the Wireless Monitoring System for commercial vehicles. It’s designed to provide updates on the state of charge and state of health of the batteries.